It has cool music and jungle-y sound effects provided by our talented Production Manager, Sam Mitschke. This video is near and dear to my heart, because Sam came around with a recorder one day and asked several of us to grunt and growl for no apparent reason, then took off. After some post-production work, those became the dinosaur noises you hear on the video. It's perhaps a dubious way to make my Internet performance debut, but I had fun. 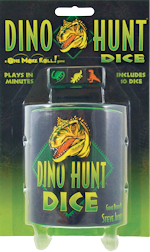 Also, Dino Hunt Dice is now available!